Attention all blogger, health, fitness and weight loss sites! Have you considered writing about electrotherapy? Now is a great time to do it. Electrotherapy is on the rise as a popular over-the-counter pain solution. This is, in part, thanks to companies like iReliev who have produced usable, effective, FDA-approved devices that anyone can use. Gone are the days when one had to make an appointment with the chiropractor or physical therapist for electrotherapy. Electrotherapy is effective, and now it’s affordable and available from companies like iReliev. 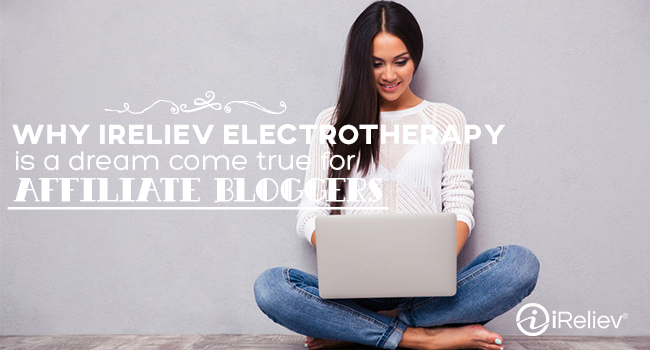 In fact, iReliev electrotherapy is a dream come true for affiliate bloggers. It’s an excellent subject for an article. Plus, iReliev’s affiliate program offers you 20% commission. Perhaps this has grabbed your attention, but you’re still not sure what you would write or whether it would interest anyone. Truth be told, there’s much to be said about electrotherapy. It may have just recently gained a prominent spot in the over-the-counter market, but electrotherapy has actually been around for a long time. Ancient Egyptians get credit for the first “ah-ha” moment when they discovered that stepping on an electric fish helped to relieve headaches. How’s that for a unique origin? Why is Electrotherapy Such a Great Affiliate Opportunity? If you’re still trying to get an idea of how this would fit in with your audience and why it’s relevant in the health and fitness industry, let us explain. For one thing, there’s a real lack of awareness where electrotherapy is concerned. If you mention it casually to a group, most people will not have heard of it or will mistake it for something else. Because electrotherapy is so new and unique as a home-use product, many people are unaware of its benefits or how it works. With a voice and presence in the health and fitness world, you have the option to correct that. Making readers aware of an alternative to painkillers could change their lives. Plus, when electrotherapy works for them, they’ll remember where they learned about it first. In this day and age, people need an alternative to painkillers. America’s dependency to prescription drugs has become an epidemic. Electrotherapy devices like iReliev’s TENS (transcutaneous electrical nerve stimulation) Unit provide noninvasive ways of relieving pain from chronic and acute injuries anytime, anyplace. That’s something worth sharing with the health and fitness world. Fitness and weight loss blogs might also be interested in an angle that looks at iReliev’s EMS (electrical muscle stimulation) machine. EMS devices use electrical impulses to stimulate muscles, which helps increase blood flow to the area and encourage growth. Athletes can use EMS devices as a way to care for tight or sore muscles without counting on painkillers like Advil or Tylenol, which are detrimental to muscle growth. There are lots of angles you can take as a blogger. No matter which way you look at it, becoming an iReliev affiliate promises to be good for you and your readers. Check out ireliev.com/ireliev-affiliate/ to learn more details about the program.